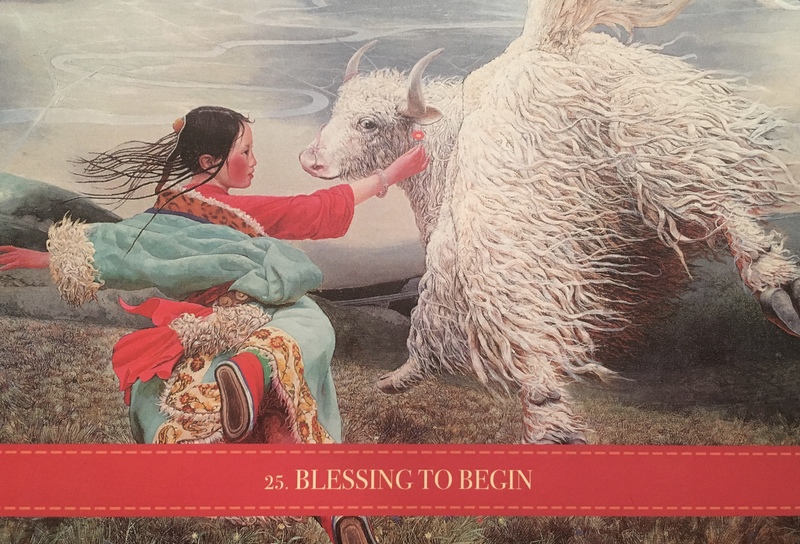 “You are being given a ‘leg up’, a blessing to begin. The Divine is going to help you launch something important – an idea, a seedling of hope, a new start. It may feel as though something is being handed to you, as though the Divine is offering you some sacred help. Don’t fall into the trap of believing that because it is easy in the beginning it is no worthwhile or important. It is! Sometimes we get an infusion of divine energy into a start-up to get it going because the Divine knows how important it is and wants to give us a helping hand. Accept the help and opportunity that so easily comes your way now, but also remember that you are being given help because there is something of great worth here. Sometimes human beings have a quirk in their nature, and if something happens too easily or readily it is dismissed. Don’t let such foolishness sully your wisdom. Responsibility for the idea developing further and coming to life beyond this initial beginning will lie with you. You are up to the task. You can do it! That is why it was given to you and why you shall be helped in the early stages. If there are new opportunities coming your way, act on them. Say yes! The Divine Mother has sent these to you so that you may find your way and ultimately help not only yourself, but others too through your life journey. Do not feel guilty or unworthy for any assistance, help of ‘free pass’ that you receive at this time. The Divine is moving you forwards with loving purpose. This oracle also brings guidance for those with a project further along the path who have perhaps hit an obstacle or are struggling. You may be wondering if this is a sign that you should give up on the dream, that it’s time to let it go and do something else instead. This oracle suggests that you should remember why you started. Perhaps reconsider giving up, at least for now. You can detach from the form of the original project if you wish, allowing for the universe to adjust the details, but if your heart still beats for the essence, for the initial purpose, honour that. Perhaps choose to keep going for a time, even if the path seems harder than it was at the beginning. The reason it seems more challenging is not because it has become ‘the wrong path’ as such. It is just that you are bearing more of the load on your own because your soul is strong enough to do it. Your heart is courageous enough to still have trust and faith, and your mind is willing to acknowledge doubts and uncertainties without allowing them to overcome your resolve to continue and see this idea or dream through to completion. You see beloved, this dream is perfect for you. It will ask you to grow so that it can happen, and the growth asked of you is exactly what your heart and soul needs for further empowerment. You can imagine it as something like the Divine Mother removing the ‘training wheels’ from your bicycle since you are now ready to master the skill of riding on your own. Will grace still be there when you need it? Of course! But there is much leaning and satisfaction, confidence and trust in yourself to be gained from the current state of affairs too. Look to internal self-mastery, and resolution in the outer set of circumstances will follow. The oracle of Blessings To Begin is a confirmation of an idea or question about a new beginning. If you are asking about being ready to start something, be that a project or even a new relationship, an expansion in your family or a new training program, this is your affirmation and validation from higher guidance. If you are dreaming to start a project and wanting to set wheels in motion, invoke your Divine Blessing, then watch it come to life with the assistance of the Divine. Whatever stage you are at in the manifestation of your dreams, be it the earliest glimmer of a vision, or one the you have invested decades of your life to and on which you are far along the path, the gift of the Mother is bestowed upon you – her red poppy of success. She has guided you and shall continue to do so, offering protection whenever needed whilst allowing you room to spread your wings and empower yourself by taking responsibility for your efforts too. If you stumble into arduous circumstances, ask for help and trust also that whatever is before you, you can handle it, even if sometimes you question that before conquering the issue at hand. Maybe, just maybe, you are in the midst of being tested. Will you throw in the towel? Give up and move on? Or will you persevere? Is what you want important enough to you to keep it in the forefront of your focus? Are you willing to give it all you’ve got in order to get there? Do you believe in yourself? Do you feel worthy? Are you taking action every day in some way, big or small to get where you need to go? Do you remember why you wanted to get there? What was it about your desire that inspired you to follow your heart in the first place? Faith is your life raft right now. It is what will take you to the next level of being. Faith will open doors for you. Faith will provide. Things may not be turning out quite the way you wanted or expected. Maybe you are getting tired, maybe it seems like too much work, or that you have too many obstacles or challenges in your way. But things are just about to turn around. Have Faith. The Goddess Kuan Yin is beside you. She is supporting you. She is embracing you, lifting you up. She sees you. She believes in you. Have faith that she will assist you in this next step of your journey. You are on the right path. See your own Divinity. See your beauty and Light. See past the illusions and go forward fearlessly. Do not give up now. Thank you for always sending me words that seem as light and act as real encouragement to me at all times, especially when I’m in my lowest of lows and experiencing the utmost dark night of soul. Thank you. I am truly grateful. Hang in there Lucy, focus all of your intention on the highest good of all. We all have our challenges and are doing our best to navigate through them with strength, courage and peace. Talk to your angels and see the Divine within you. Big hugs, blessings love and light to you.